A permanent political class has emerged on a scale unprecedented in our nation 's history. Its self-dealing, nepotism, and corruption contribute to rising inequality. Its reach extends from the governing elite throughout nongovernmental institutions. Aside from constituting an oligarchy of prestige and power, it enables the creation of an aristocracy of massive inherited wealth that is accumulating immense political power. 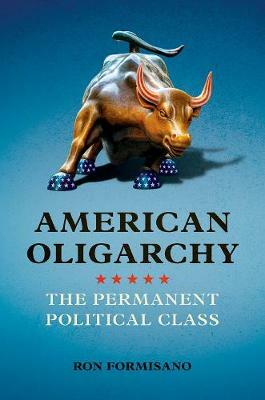 In a muckraking tour de force reminiscent of Lincoln Steffens, Upton Sinclair, and C. Wright Mills, American Oligarchy demonstrates the way the corrupt culture of the permanent political class extends down to the state and local level. Ron Formisano breaks down the ways this class creates economic inequality and how its own endemic corruption infects our entire society. Formisano delves into the work of not just politicians but lobbyists, consultants, appointed bureaucrats, pollsters, celebrity journalists, behind-the-scenes billionaires, and others. Their shameless pursuit of wealth and self-aggrandizement, often at taxpayer expense, rewards channeling the flow of income and wealth to elites. That inequality in turn has choked off social mobility and made a joke of meritocracy. As Formisano shows, these forces respond to the oligarchy 's power and compete to bask in the presence of the .01 percent. They also exacerbate the dangerous instability of an American democracy divided between extreme wealth and extreme poverty.